FILE - Ivory Coast President Laurent Gbagbo and his wife Simone Ehivet Gbagbo attend a memorial ceremony at Felix Houphouet Boigny stadium in Abidjan. Simone Gbagbo's supporters gave her a warm welcome as she entered the criminal court that will judge her in Abidjan. While Laurent Gbagbo is on trial at the International Criminal Court in The Hague, Simone Gbagbo is being tried in Ivory Coast because Ivorian authorities refused to transfer her, claiming the country's justice system is capable of judging her. 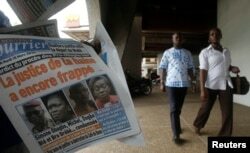 People walk past a man selling a copy of Le Nouveau Courrier, which has a picture of Ivory Coast's former first lady Simone Gbagbo (2nd L, on newspaper), in Abidjan, March 10, 2015. Representing the state, prosecutor Soungalo Coulibaly says he is hoping justice will be served for the victims, who have suffered a lot. "Justice must be served in order to reconcile the population," he said.